Art Water Color Brush Pens AWESOME PRICE! Better Quality at Lower Price: Aen Art paint pens offer richer colors & more Flexible Nylon brush tips than you'd get with costlier brands. Recommend this value pack as a great addition to any artist's supplies and hand lettering.✎✎NOTICE: The tips are like real brush tips which means you do not need to push hard like a pen. Use it like a paint brush tip even when coloring or writing. Durable & Portable: Real Brush Pens are made of durable nylon brush hairs which give you precision control. So you can easily do everything from light pastel washes to subtle shading & gradients. Without fuss, muss, mess on your coloring books. Bright Vibrant Colors: All 24 colors are very vibrant and lay down easily without streaking or leaving wet marks. Like Real Brushes, Easily blend with water and get in to those tiny spaces. We know a true brush tip pen is for Artists and Beginner Painters. 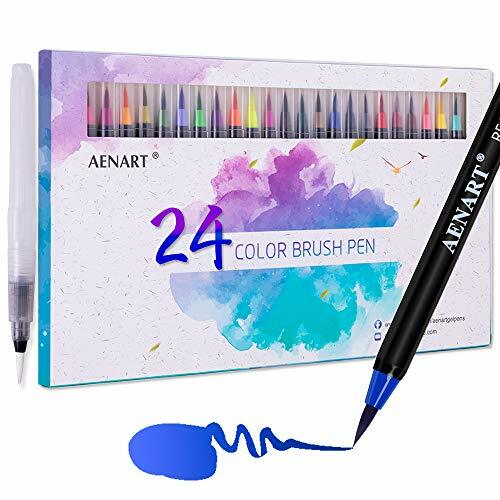 Special Brush Pen set: 24 painting & drawing markers plus 1 bonus water brush let you have a fun & safe coloring experience, As brush pens are easy to use and dries quickly. If you have problems, just let us know & we'll give you a satisfied reply. ✎✎NOTICE: when you find the brush pens is litter dried or you don't use it for, Please keep the tips pointing downward to keep the ink flowing in to the tips.